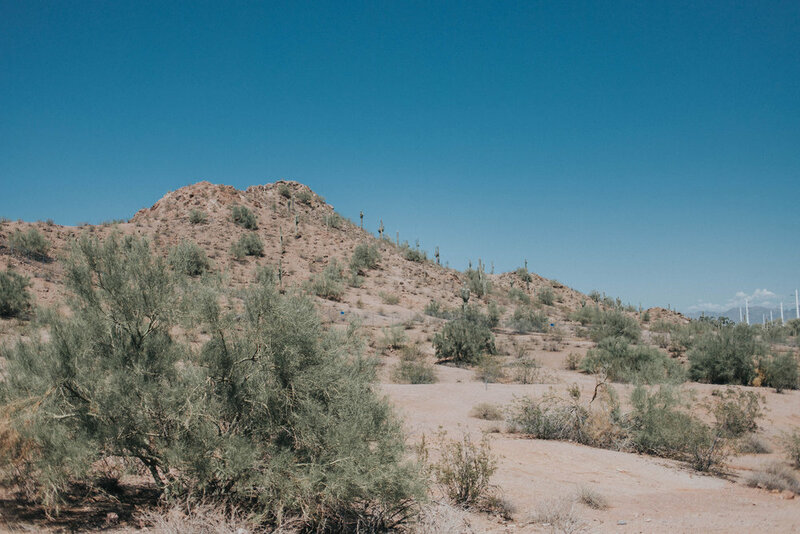 Weâ€™re onto some posts fromâ€¦ the desert! If you didnâ€™t know, Eric and I took a long weekend trip with my family to Arizona. It was my first time visiting the area (except for a small work trip once), so I was really excited! It was a fun weekend, with a good mix of relaxing and heading out to explore. Eric and I were able to meet up with my good friend, Chelsea of Chelsea Bird, and her husband, Scott, and they showed us around Phoenix for a little bit! 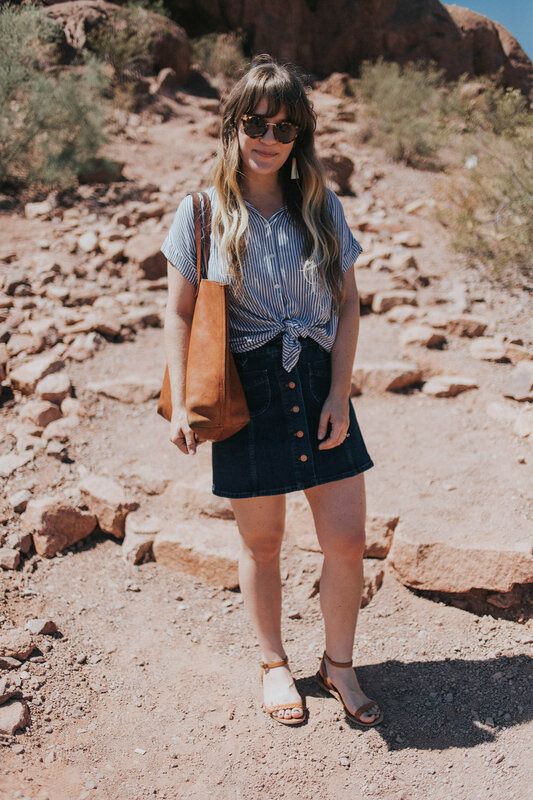 I was so happy to get the chance to hang out with them, and to explore the desert! It was my first time seeing cactus (growing out of the ground ðŸ˜‚) and that was one of my favorite things! 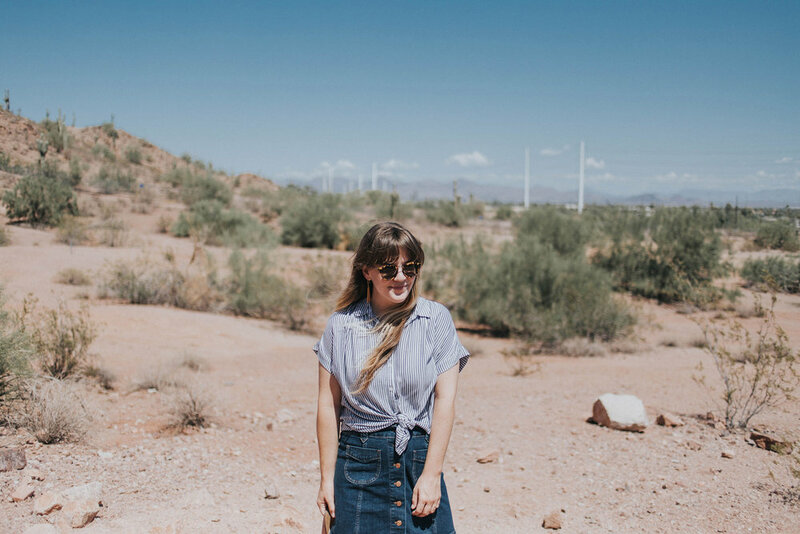 I loved the vibes and landscape of Arizona. So much different than Michigan â€” nature and weather-wise â€” and I loved the opportunity to experience something totally new! Scott and Chelsea picked us up from our Airbnb, and we had a delicious brunch at Wild Flower Bread Company. I tried the spicy chorizo frittata, which came with rosemary roasted potatoes. Delicious! They first took us to Cosanti Originals, which is an outdoor studio and gallery of architect/sculptor/wind-chime designer Paolo Soleri. 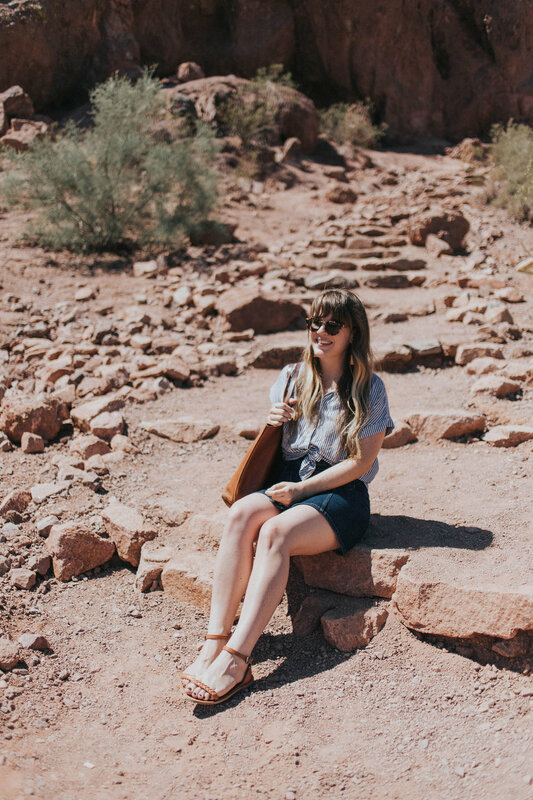 It was so fun to walk around the historic site and get a glimpse of all the terraced landscaping with experimental earth-formed concrete structures. 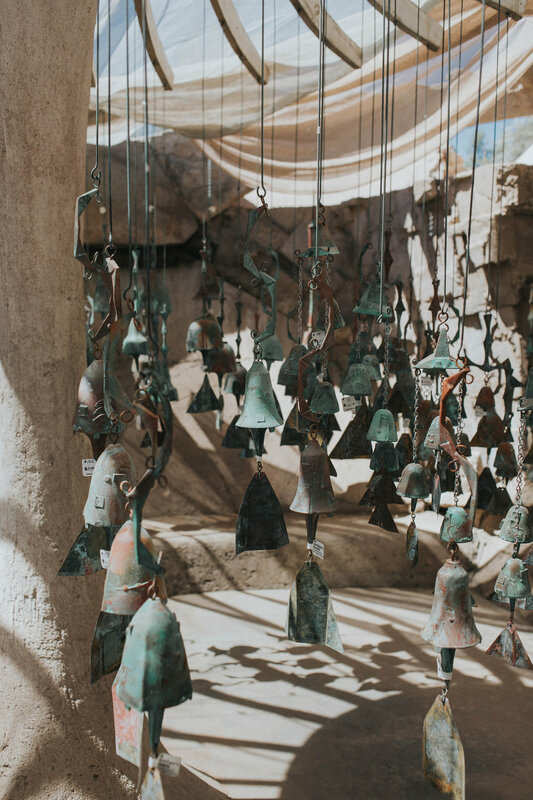 There were so many bronze and ceramic wind-bells to look atâ€¦ so pretty and unique to the area! 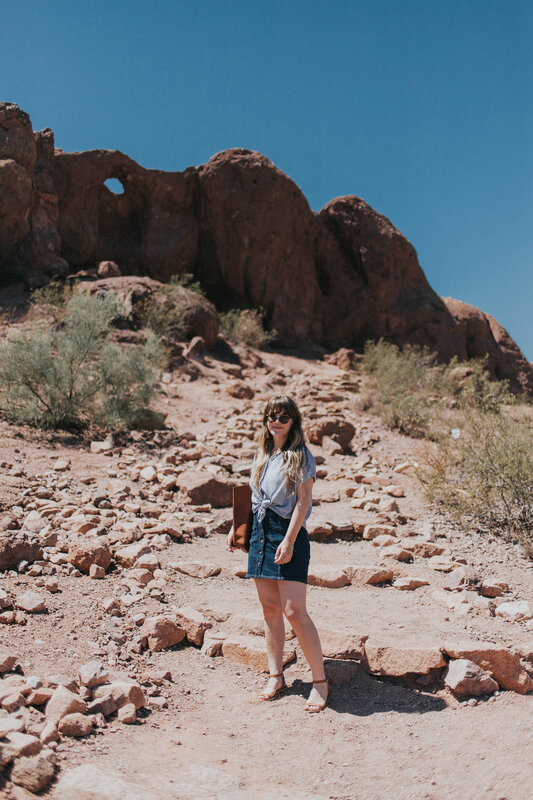 After walking around there for a bit, we drove over to Papago Park to see the Hole in the Rock formation! We got out of the air-conditioned car to make the trek up to the top, which was definitely worth the wave of heat! Itâ€™s an easy walk, and the view from the top was really neat to see! 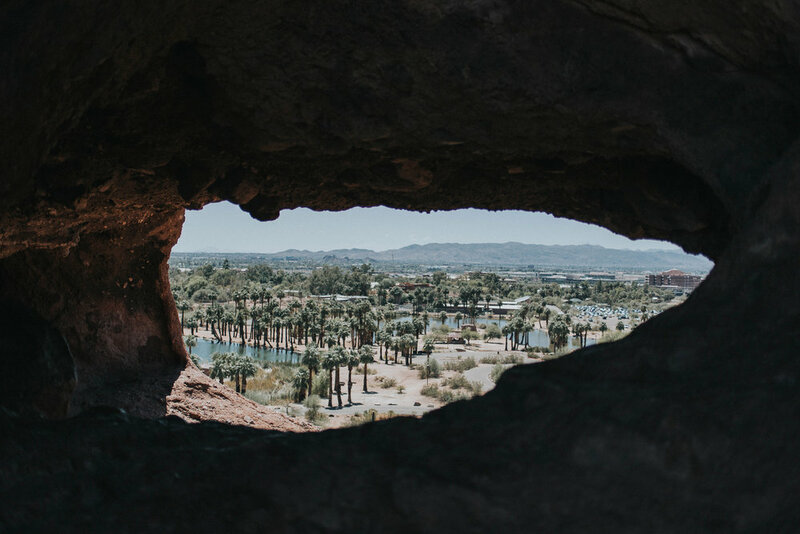 Plus, once youâ€™re at the top, a nearly constant wind blows through the opening in the rock, which was a very welcomed feeling in the 100Âº+ heat! Eric and I snapped a few pictures at the bottom of the stairs, but quickly high-tailed it out of there to hop back into their air conditioned car. 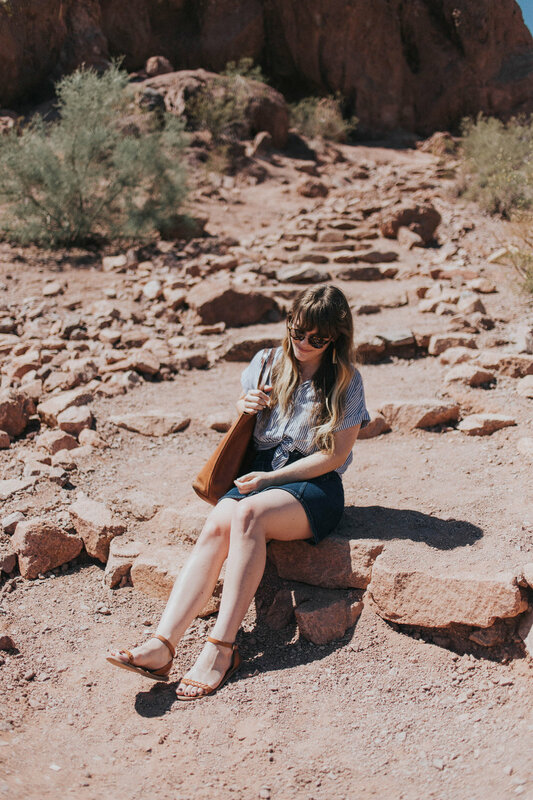 I swear I was pretty much in a constant state of â€œsweatyâ€� during our time in Arizona. Haha! 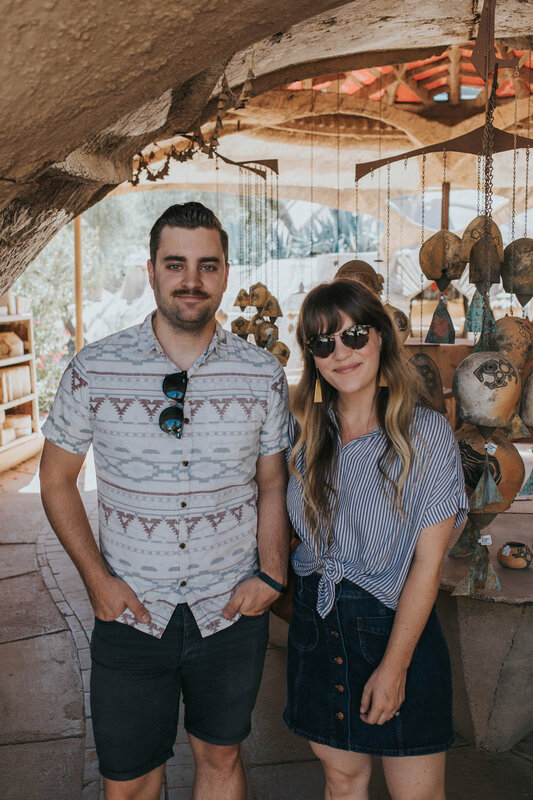 After that, Scott and Chelsea took us to explore a cute plant shop in downtown Phoenix called The Bosque Plant Shop. I loved it! I wanted to take home a cute cactus planter, but wasnâ€™t sure how Iâ€™d fit it in my suitcase home. ðŸ˜‰ To beat the heat after that, we went to Nami, which is a vegan coffee, pastry, and ice-cream shop! Chelsea told me about their tSoynami and I knew I had to try it. Itâ€™s a homemade vegan soy soft serve, and they mix all sorts of goodies into it â€” like cakes, cookies, you name it. I tried their signature Soy Capitan, which had crunchy fruity cereal and strawberries. I might need to have Chels ship me one of those somehow! After our treats, we had to head back to our Airbnb, but it was so wonderful to spend the morning with them!